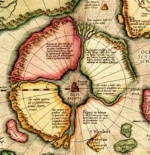 Second in the series on Hyperborea, and possibility that the North Pole was location of the garden of Eden and cradle of humanity. We will also further elaborate upon the difference between paradise and the garden of Eden. This information will also elaborate upon how the north is also doorway portal to and from the throne of Most High God which the angels utilized to ascend into heaven and descend to the earth. In this show I will present myriads of other pieces of scriptural evidence which together stand as confirmation of this as possibility.